Mastering the Art of French Cooking is a two-volume French cookbook written by American author Julia Child, Simone Beck, and Louisette Bertholle, both of France. Written for the American market, it was published by Alfred A. Knopf in 1961 (Volume 1) and 1970 (Volume 2). Widely credited with bringing French cuisine into the American home, it has since become a standard in the culinary world. Originally, a third volume was planned but Child lost interest in the project as her television career took off and so Simone Beck published separately what would have been the third volume as Simca's Cuisine. The first edition of the first volume, published in 1961 by Knopf in patterned white boards and a blue and white pictorial jacket states "First edition" on the copyright page. The first of the second volume was not published until 1970 in similarly patterned boards and a dark blue and white jacket, and also states "First Edition" on the copyright page. Both are highly collectible, and as with most cookbooks, copies in nice condition with a jacket are uncommon. Childs' signature adds considerable value to each and in fact even early printings can be quite valuable with the authors' signatures. New York: Alfred A. Knopf, 1961. First Edition. Hardcover. Very Good. First edition stated, first printing. Signed by Julia Child and and her husband Paul on the front free end paper, inscribed to a former owner. Very Good. Decorated cloth is faded, primarily at the spine and rear cover. Small ding to spine. Light staining to rear pages. Biopredation to edge of page block, affecting end sheets as well.. First edition as stated, signed by Julia Child and her husband. New York: Alfred A. Knopf, 1961. First Edition. Very Good. First edition stated, first printing. Signed by Julia Child and and Simone Beck on the front free end paper. Bound in publisher's white slick cloth with red Fleur-de-lis and blue stars, turquoise endsheets, top edge stained red, lacking the dust jacket. Very Good. Spine cloth faded. Spine and textblock edges lightly stains, affecting several pages as well. First edition as stated, signed by Julia Child and Simone Beck. New York: Alfred A. Knopf, 1961. First Edition. Hardcover. Good. First edition stated, first printing. Signed by Julia Child and Simone Beck on the half-title page. Good, with spine cloth faded, water staining to red top stain. Contents fair, with heavy rippling to pages throughout; light, sporadic notations to text, and an occasional stain. In a price-clipped dust jacket, perhaps which has been supplied, with a toned spine, chipping to the spine ends and tape repairs made to the blank verso. First edition as stated, signed by two of the three contributors. London: Cassel & Company, 1963. First Edition. Very Good. Advance uncorrected proof of the first British edition. Publisher's drab printed wraps. Very Good, with creasing wear to wraps, several small stains and foxing to top edge of page block. An extremely uncommon format of the iconic cookbook. This British edition was preceded by the American edition, which was published two years earlier. New York: Knopf, 1964. First edition, eighth printing. Hardcover. Very good(+) in good, unclipped dust jacket protected in mylar; first the pages are nearly like new: clean, crisp, bright and free of marks and creases (very light, barely noticeable foxing to pages 518 and 519); DJ is heavily chipped at the spin edges and corners and folds; 1" open tear at rear open edge of DJ; verso of DJ is reinforced with tape at the folds; DJ and verso DJ are soiled, sunned and moderately foxed; a piece of scotch tape horizontally across the top of the spine head; despite all the signs of wear and age, DJ is in one piece and still charming; cloth lightly rubbed at spine ends (no fraying); light soil, sunning and foxing to spine and cloth along the spine joints and edges; lightly dust-soiled edges of pages; binding is tight and square; hinges are tight; we gently loved copy in a well-loved DJ./good. Quarto in white cloth patterened fleur-de-lis in blue and white DJ patterned in white fleur-de-lis; illus. ; 684 pp., 26 cm. ; $10.00 price on flap, 1061 on bottom corner of front flap; teal endpapers. In English. || Signed by Julia Child and Paul Child on half-title page; includes index. "This is a Borzoi book"--Title page verso; illustrations by Sidonie Coryn; first edition, 8th printing, December 1964.Very good(+) in good, unclipped dust jacket protected in mylar; first the pages are nearly like new: clean, crisp, bright and free of marks and creases (very light, barely noticeable foxing to pages 518 and 519); DJ is heavily chipped at the spin edges and corners and folds; 1" open tear at rear open edge of DJ; verso of DJ is reinforced with tape at the folds; DJ and verso DJ are soiled, sunned and moderately foxed; a piece of scotch tape horizontally across the top of the spine head; despite all the signs of wear and age, DJ is in one piece and still charming; cloth lightly rubbed at spine ends (no fraying); light soil, sunning and foxing to spine and cloth along the spine joints and edges; lightly dust-soiled edges of pages; binding is tight and square; hinges are tight; we gently loved copy in a well-loved DJ. New York, N.Y.: Alfred A. Knopf, 1968. SIGNED by Paul and Julia Child on front endpaper Hardcover 1968 Dust jacket is chipped at edges and corners . Signed. Hard Cover. Very Good/Good. New York: Alfred A. Knopf, 1961. First Edition. Very Good. First edition stated, first printing; "About the Authors" page dated August, 1961 at rear. Very Good with a little toning to covers along top edge, fading to red topstain. A 1.5 x 2" piece of the top corner of first blank page has been torn out. Lackign the dust jacket. A rather lovely copy of this modern culinary cornerstone. Penguin Books Ltd. PAPERBACK. 0140461191 New Condition. . New. Penguin Books Ltd. PAPERBACK. 0140461191 Like New Condition. . Fine. New York: Alfred A. Knopf. 1961. First Edition; Second Printing. Hardcover. Very Good+ in a Fair dust jacket. Edge wear and soiling. Opened tear to front panel's upper edge, closed tears to lower edge. Closed tears to rear panel's upper and lower edges. Chip to lower left corner. ; 8vo 8" - 9" tall; Original unclipped dust jacket protected by archival Brodart cover. All domestic orders shipped protected in a Box. .
New York: Alfred A. Knopf, 1992. Hardcover. Very Good. Reprint. Signed by Julia Child and inscribed to former owner on half-title page. Near Fine with fading to spine and light splattering to red topstain. In a Near Find dust ajcket with fading to spine panel and a small tear near the head. Signed. New York: Alfred A. Knopf, 1961. First Edition. Hardcover. Good. Stated first edition, first printing. Good. Cloth faded at spine, with a short tear to the bottom of the front joint, rubbed at corners. Previous owner name to front free end paper and following page, light marking to pages. Water stain to top edge of page block, with waviness to pages. Lacking the dust jacket. Not the most beautiful copy, but still a serviceable first printing of this modern culinary corner stone. New York: Alfred A. Knopf, 1973. Reprint. Very Good. Seventh printing. Signed by Julia Child and her husband Paul on the front free end paper, and inscribed to a previous owner. Very Good. Light toning and light soiling to cloth, spine slightly faded. Textblock edge is lightly soiled. A nice copy, signed by Julia Child and her husband. This is a First Edition, 2nd Printing of vol. 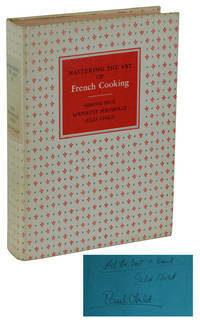 1 of Julia Child's "Mastering the Art of French Cooking". Condition is very good, including binding with little wear and tear. There is minimal discoloration of cover due to age. New York: Alfred A. Knopf, 1971. Hardcover. Very Good/Very Good. Drawings by Sidonie Coryn. Twentieth Printing. Inscribed on the half title page by Julia and Paul Child. Very Good in an about Very Good jacket, sizeable loss to the bottom of the spine edge, else fine. Patterned white buckram on the boards, bumped at the foot of the spine. Square, some reading wear on the binding, clean internally. This book jumpstarted Child's career and is responsible for her receiving her television show The French Chef. New York: Alfred a Knopf. 1973. First Edition; Twenty-Fourth Printing. Hardcover. Very Good in a Good dust jacket. Multiple chips and tears, creasing and wear to flap folds. ; Small 4to 9" - 11" tall; Original unclipped dust jacket protected by archival Brodart cover. All domestic orders shipped protected in a Box. .
New York: Alfred A. Knopf. Very Good with no dust jacket. [c.1961-1975]. BCE. Hardcover. A full-sized book club edition of the authors' much admired guide to preparation of French cuisine, later followed by a second volume. This work propelled Julia Child and her co-authors to worldwide fame. Includes illustrations by Sidonie Coryn. With an extensive index. Volume bears 1961 date but could have been published c.1961-1975. --- In fleurs-de-lis patterned full cloth-covered boards. Jacket with Paul Child photo of the authors and Chef Paul Bugnard preparing a dish. --- With a chewed top front cover and jacket corner, and insertion of acidic paper item has left a stain to front free endpaper, otherwise a clean firm copy. Bright jacket with slight soiling and in removable mylar protector. ; tall 8vo 9" - 10" tall; xvi, 726 pages . Knopf. Hardcover. 0307593525 Special order direct from the distributor . New. Alfred A. Knopf. No Jacket, Very Little Scuffing, Soiling Or Edge Wear On The Covers. An Excellent Book For Those Want To Learn Traditional French Cooking And Those Who Don't Worry About Waistlines And Calories. . Very Good. Hardcover. 1971. Knopf. Hardcover. 0307593525 . New. Knopf. Hardcover. 0307593525 Remainder mark . Fine. Alfred A. Knopf. Hardcover. B001KK2NDQ 1963 Knopf hard cover - 1st edition 5th printing - no dust jacket - minor staining to page edge - slight ding to tom edge of cover - otherwise cover fine binding strong contents clean - enjoy . Very Good. New York: Knopf. 1961. Book Club Edition. Hardcover. Very Good in a Very Good dust jacket. Chipping at spine crown/heel and top of rear panel. Few small open tears throughout jacket. Light soiling on spine and rear panel. .
Knopf. Hardcover. 0307593525 Item in very good condition! Textbooks may not include supplemental items i.e. CDs, access codes etc... . Very Good. Knopf. Hardcover. 0307593525 Brand New From The Publisher! Not Marked Up Remainders or Shelf Worn Overstocks! . New. New York: Alfred A. Knopf, 1966 This classic cookbook has a white cover with red and blue patterns, and white lettering on a red background. This is the 12th printing of the book, from August 1966. 684 pages, plus index; approx. 7"x9". Book is in good condition with wear and soil.. Hard Cover. Good/No Jacket. Illus. by Illustrated. NY: Alfred A Knopf, 1961. (USA) First edition; second printing. This book has been around the block: there is considerable wear to the head of spine, the top corner of the front cover is bumped and the corenr tip worn away, there is 3" split to the cover fabric at the rear spine gutter at the foot of the spine, soiling to the page edges, there are pencil notations to some of the recipes, spine faded and soiled, recipes written to the last blank page, Poor copy; lacking the dust jacket. . 26 x 18cm, patterned cloth, [i-vii] viii-x [xi-xiii] xiv-xv [xvi] [1-3] 4-684pp, [i] ii-xxxii index. B&W instructional drawings in text. This is an early printing with the date "October 16, 1961" to the copyright page and the date of October 1961 to the Author's page. The order of the authors'names are in alphbetical order: Simone Beck, Louisette Bertholle, Julia Child. . This classic cookbook introduced North Americans to the art and technique of French cooking. The recipes are clearly arranged with a master recipe introducing the technique and then recipe variations. This is the first volume, first published in 1961; there was a second volume first published in 1970. David Rosengarten ( in TASTE) says that this book was for him, "the most important book" as "it was a book to work through systematically, no a book to surf...If one does work through this book page by page...one has taken the equivalent of a cooking course". A heavy book. (3.8 Jm HOQ 103/3. Hardcover. Poor/Lacking the Jacket. Illus. by CORYN, Sidonie. 8vo - over 7¾" - 9¾" tall. New York: Alfred A. Knopf, 1963. Stated Fourth Printing, September 1963. Patterned fleur-de-lis boards w/turquoise stars, black and white cover and spine titles on crisp orange fields, lt. shelf wear. Pages near fine, no writing. Spine fine, hinges intact. Near fine, very early printing. Original first edition cover titles - with Simone Beck listed above Julia Child. "Mastering the Art of French Cooking" is for both seasoned cooks and beginners who love good food & long to reproduce at home the savory delights of the classic cuisine, from the historic Gallic masterpieces to the seemingly artless perfection of a dish of spring-green peas. This beautiful book, with over 100 instructive illustrations, is revolutionary in its approach because: It leads the cook infallibly from the buying and handling of raw ingredients, through each essential step of a recipe, to the final creation of a delicate confection. It breaks down the classic cuisine into a logical sequence of themes and variations rather than presenting an endless and diffuse catalogue of recipes; the focus is on key recipes that form the backbone of French cookery and lend themselves to an infinite number of elaborations bound to increase anyone's culinary repertoire. 684 pages plus index. Insured post.. First Edition. Hardcover. Fine. Illus. by Coryn, Sidonie (Illustration). 4to - over 9¾" - 12" tall. Book. New York: Alfred A. Knopf, 1966 This book is the 12th printing of the first edition and is both for seasoned cooks and beginners who love good food and long to reproduce at home the savory delights of the classic cuisine, from the historic Gallic masterpieces to the seemingly artless perfection of a dish of spring-green peas. jacket has edgewear, a crease on the cover, soil, the top ends are browned, and the spine is faded, book has owner's name, soil, and stains on the foredge. 684 pages plus 32 pages of index, 10 x 7.. Hard Cover. Good/Fair. Illus. by Coryn, Sidonie. New York: Alfred A. Knopf, 1963. Stated Fifth Printing, December 1963. Scarce early printing. Patterned fleur-de-lis boards w/turquoise stars, black and white cover and spine titles on crisp orange fields, lt. shelf wear. Original first edition cover titles - with Simone Beck above Julia Child. Pages fine, no writing. White endpapers. Orange top-stain. Bind fine; hinges intact. Near fine example. "Mastering the Art of French Cooking" is for both seasoned cooks and beginners who love good food & long to reproduce at home the savory delights of the classic cuisine, from the historic Gallic masterpieces to the seemingly artless perfection of a dish of spring-green peas. This beautiful book, with over 100 instructive illustrations, is revolutionary in its approach because: It leads the cook infallibly from the buying and handling of raw ingredients, through each essential step of a recipe, to the final creation of a delicate confection. It breaks down the classic cuisine into a logical sequence of themes and variations rather than presenting an endless and diffuse catalogue of recipes; the focus is on key recipes that form the backbone of French cookery and lend themselves to an infinite number of elaborations bound to increase anyone's culinary repertoire. 684 pages plus index. Insured post.. First Edition. Hardcover. Fine. Illus. by Coryn, Sidonie (Illustration). 4to - over 9¾" - 12" tall. Book. Paperback. Fair. marks on box. Dispatched within 1 working day. Sold by the U.K. charity Langdon: supporting men and women with disabilities. Penguin Books. PAPERBACK. 0141048417 New Condition. . New. Knopf. Hardcover. 0394533992 New Condition. . New. Alfred A. Knopf. No Jacket, Top Of Spine Is Missing About A 1/8 Of An Inch Tear, Some Staining On The Outer Page Edges Of The Top Of The Book. Some Soiling & Staining On The Cover, Previous Owner's Name On The Inside. An Excellent Book For Those Want To Learn Traditional French Cooking And Those Who Don't Worry About Waistlines And Calories. . Good. Hardcover. 1971. Knopf. Hardcover. B000NL5TNO First Edition, Seventh Printing - 1964 -- Heavily worn dust jacket and boards; No inside markings. ~ We Ship within 24 Hours + FREE Tracking, answer emails fast, accept returns & work hard to deliver 100% customer satisfaction! . Good. New York, New York, U.S.A.: Alfred A. Knopf, 1971. Good Hardcover with good dustjacket 1971, soiling on spotting on fore-edge and dustjacket. Hard Cover. Good/Good. New York: Alfred A. Knopf , 1970. Hardcover. Very Good/good. Shelf wear to tips, corners, and edges of the books, previous owner's name to volume 2; the jackets are chipped, worn and torn in jacket protectors. Volume one is a printing of 1975 while two is a 1970 "first and second printing before publication." The cook books that revolutionized non-professional cooking in America. Michael Field, writing for the New York Review of Books, praised Beck, Bertholle, and Child for "not limiting themselves to la haute cuisine," and stated that "for once, the architectural structure of the French cuisine is firmly and precisely outlined in American terms." --New York Review of Books, Nov. 25, 1965. Every effort is made to ship all books and other items within 24 hours. Clean recycled packing material will be used when possible. The Book Shed has a been a member of the Vermont Antiquarian Bookseller's Association since 1997. An online bookseller with a bookshop sensibility! Alfred A. Knopf. Paperback. 0394721144 Both books. NO BOX. Some water damage. Great reading copy. . Fair. 1986-01-01. Later prt..
New York: Alfred A. Knopf, 1964. Stated Sixth Printing, May 1964. Patterned fleur-de-lis boards w/turquoise stars, black and white cover and spine titles on crisp orange fields, fine. Original first edition cover titles with Simone Beck listed above Julia Child. Pages fine; no writing. White endpapers. Red top edge. Bind solid, straight; hinges intact. Typography and binding by Warren Chappell; illustrations by Sidonie Coryn. Near fine example. "Mastering the Art of French Cooking" is for both seasoned cooks and beginners who love good food & long to reproduce at home the savory delights of the classic cuisine, from the historic Gallic masterpieces to the seemingly artless perfection of a dish of spring-green peas. This beautiful book, with over 100 instructive illustrations, is revolutionary in its approach because: It leads the cook infallibly from the buying and handling of raw ingredients, through each essential step of a recipe, to the final creation of a delicate confection. It breaks down the classic cuisine into a logical sequence of themes and variations rather than presenting an endless and diffuse catalogue of recipes; the focus is on key recipes that form the backbone of French cookery and lend themselves to an infinite number of elaborations bound to increase anyone's culinary repertoire. A note about authors at last page. 684 pages plus index. Insured post.. First Edition. Hardcover. Fine. Illus. by Coryn, Sidonie (Illustrations). 4to - over 9¾" - 12" tall. Book.